Okay, I’ve been busy talking about Modern AGE but there’s another game I’m developing. It’s nastier, brutisher, and shorter—and stylistically, promotes the use of words like “brutisher.” That’s Ork! The Roleplaying Game, 2nd Edition. Ork! was Green Ronin’s first release, and its dank, beer-stained roots can be found in Chris Pramas’ NYC games with Ork! mastermind Todd Miller. These games ran on punk mayhem, goofy improvisation and the peculiar interests of their group, including The World’s Most Popular Roleplaying Game, The World’s Most Popular Fantasy Miniatures Game, and The World’s Most Popular Vaguely Depressing Filmmaker Who Fortunately We Can Name, He’s Werner Herzog And He Did That Thing About The Penguin Walking To Its Probable Death (It’s on YouTube). To turn this mash into a semi-coherent game, Chris Pramas devised a system, and out it came in the Year 2000, which back then, was practically the future, man. So Ork! is special to Chris and Todd, and to Green Ronin as a whole. It’s a funny game, but it’s been designed with the same effort as we put into games like Fantasy AGE and Blue Rose. At times this meant a bit of extra work. I was called in to work on Ork! 2nd after Jon Leitheusser had already done a significant amount of development—more than enough to produce a functional RPG. 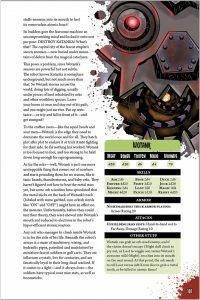 So, my role was to tune the game into something in tune with the spirit of those early games, and which would fit hand-in-glove with the style of Ork! Game mastering—what we call Orkmastering for the deepest, most story-relevant reasons, I assure you—Todd performs when he runs it at Gen Con and elsewhere. That meant a top-to-bottom review and, where necessary, redesign. 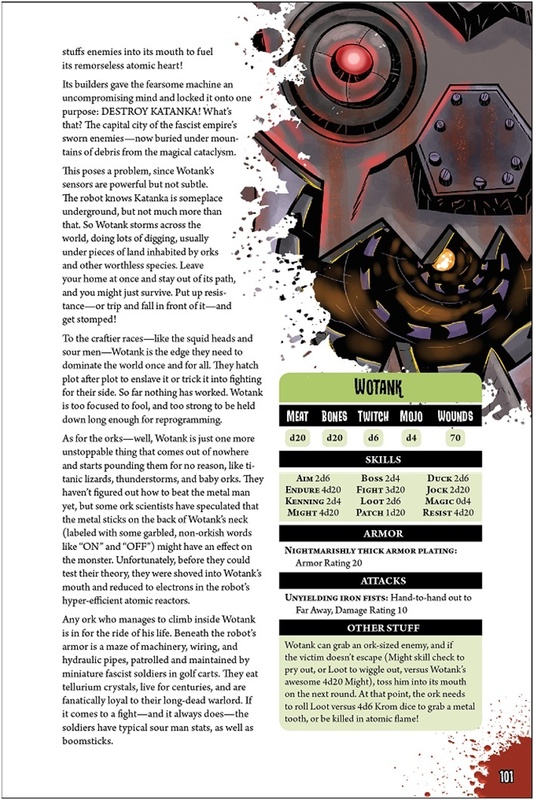 This stage got us to Cheats, where orks steal dice from the Orkmaster and each other (and risk the wrath of Krom, the merciless ork god), rules for ork magic (which risks the wrath of Krom) and other elements, all of which risk the wrath of Krom, probably. For me, one part of the design was key: In Ork!, all dice rolls are opposed! Nowadays we have two basic schools of game design. In one, we figure out how things happen in the game based on some tactical challenge or representation of how the game world works. In the other school, we settle things based on their dramatic importance, how they might contribute to a developing story arc, and so on. Orks never went to school, and live with one boneheaded truth: Krom’s got a lot of wrath to spread around. So, in Ork!, opposed rolls represent how much interest Krom has in making life difficult for characters. Krom made the universe, so for the most part, meets expectations like big mountains being tougher to claim than little ones, but may also make things harder by getting bored, believing an ork is acting in a pathetic, unorkly way, and so on. Rippy, spattery—perfect for Ork! I look forward to sharing the product of all this work with you. Ork! The Roleplaying Game, 2nd Edition is scheduled to come out in August 2018. The game includes all the rules you need, things to kill (in a chapter called, “Things to Kill”) and a handful of adventures sufficient to get you through a short campaign. See you then! https://greenronin.com/wp-content/uploads/2018/07/Ork2e.jpg 1059 707 Malcolm Sheppard //greenronin.com/wp-content/uploads/2017/07/RoninBanner-1.png Malcolm Sheppard2018-07-10 08:49:122018-07-10 08:49:12Ronin Roundtable: Ork! Lore and More Gore!